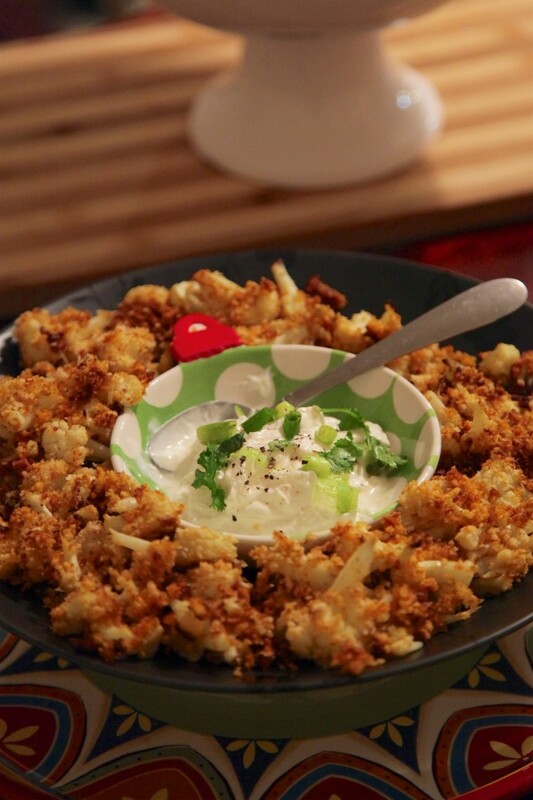 Chop cauliflower into small bite size pieces and place in a large mixing bowl. In a small bowl, whisk together 2 eggs and 1/4 cup of olive oil. Pour the mixture over the cauliflower and stir well. Make sure the cauliflower pieces are well coated. In a separate bowl, combine 3/4 cup of bread crumbs, 2 tsp paprika, 1 tsp garlic powder, 1 tsp salt and 1 tsp of pepper. Take the cauliflower pieces and drop them into the dry mixture. Once the pieces are covered in the bread crumbs place them on a prepared baking sheet. Bake for approximately 30-40 minutes.